Historic French Tudor mansion featuring six major local and regional art exhibits annually (for a total of more than 20 exhibitions), kids summer art camp, ballroom dance classes, music classes, children's art classes, holiday special events, and more. The gift shop offers unique and handcrafted jewelry, furniture, ceramics, artwork, purses, cards, photography, scarves, sculptures, baskets, quilts, mosaics and much more! Twilight Jazz Free Outdoor Concerts take place on the lawn, on select Tuesday evenings from June through August. The 9, 000 square foot mansion began life as a private residence. The majestic ceilings and large, open expanses of wall space, which were distinctive features of the mansion, now lend themselves perfectly to the display of art work. 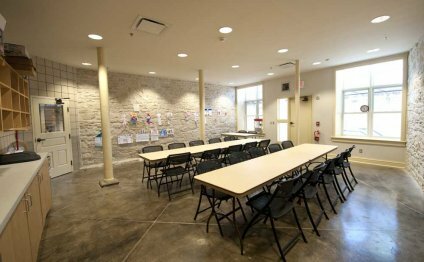 In its history, the Anderson Arts Center has evolved into a full-service, multifunctional arts center, showcasing the work of a variety of local, regional and national artists. Features served grilled steak or chicken salad lunch, floral designing demonstrations, free drawings & raffle and limited time display of “floral art” matching selected watercolor works from Wisconsin Watercolor Society. Twilight Jazz is a free outdoor concert series sponsored by area businesses and located on the grounds of Anderson Arts Center, beside Lake Michigan. Anderson Arts Center is hosting its second annual car show. Rain or shine, there will be a car show on the south lawn.